The two white chairs fit great underneath. They were a gift from my Mom that she purchased from Amazon. For the legs, Joe bought 2 long pieces of 2"x2" wood from Lowes and cut them into 4 pieces. He cut a piece of plywood to the same dimensions as the laminate (minus the front overhang), and attached the legs to the plywood using 4" bolts, driving the bolts through the plywood and into the top of the legs, with large washers between the bolt head and the plywood to distribute torque a bit. He then attached the plywood "undertable" to the countertop with smaller screws. He then sawed down the legs so that the table would fit snugly under the windowsill. Here is what the room looked like before. Do you see the kid table in this picture? Joe built that for our oldest son, and it worked great, but it became too small once he turned 4 or so. 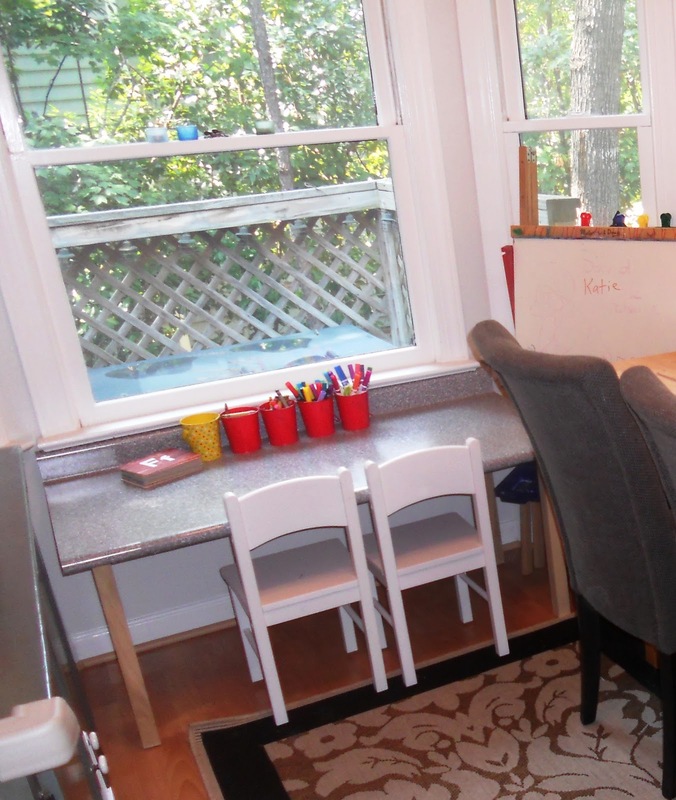 We hope this little kid's table inspires you to build your own table for your kids. It was fairly easy and a great way to use something that otherwise would have ended up in a landfill.